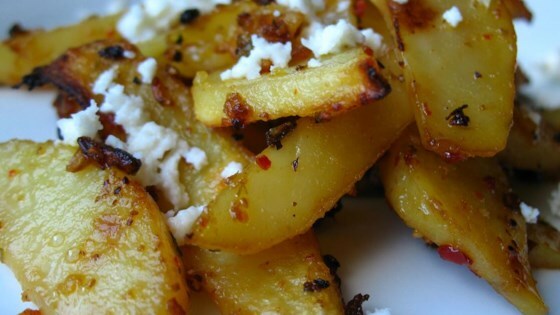 "These potatoes have a nice Mediterranean flair to them, with the lemon, garlic, and herbs. These are so delicious out of the oven topped with plenty of feta cheese." Preheat an oven to 450 degrees F (230 degrees C). Lightly oil a large baking dish. Stir the potatoes, garlic, olive oil, water, lemon juice, salt, and pepper together in a bowl until the potatoes are evenly coated; pour into the prepared baking dish. Roast in the preheated oven until the potatoes begin to brown, about 40 minutes. Season the potatoes with the oregano and mint. If the dish appears dry, pour another 1/2 cup water into the dish. Return to the oven and bake about 40 minutes more. Top with the crumbled feta cheese to serve. Followed the recipes exactly with ok results but no wow factor. May or may not make again.These are just average.